Barbra Steisand's 'Partners' album to be released September 15th. Barbra Streisand Makes History with “Partners,” Becoming Only Recording Artist with Number One Albums in Six Consecutive Decades NEW YORK, September 24, 2014 It’s official – Barbra Streisand’s “Partners” has entered the Billboard 200 chart at number one, making her the only recording artist in history to have a number one release in six consecutive decades. Barbra Streisand has recorded fifty-one gold, thirty platinum and thirteen multi-platinum albums in her career, including ten number ones: “People,” “The Way We Were,” “A Star is Born,” “Guilty,” “The Broadway Album,” “Greatest Hits Volume 2,” “Back to Broadway,” “Higher Ground,” “Love is the Answer” and now “Partners.” With ten, Streisand is the female artist with the most number one albums in Billboard’s history. “Partners” is Ms. Streisand’s 33rd album to make it into the Top 10 on the US charts. She is the only female artist to have achieved this milestone, tying her with Frank Sinatra. Earlier today, Ms. Streisand posted the following note to her Facebook account thanking her fans, her duet partners and her team:Hearing the news that “Partners” entered the charts at #1 was an overwhelming feeling of joy!! Being told that I’ve had #1 albums in six consecutive decades makes me feel truly blessed and grateful to have such loyal fans. I feel you rooting for me and I so appreciate all of your energy and support. It’s especially sweet since I get to share this moment with my wonderfully talented partners who I had the pleasure of singing with: Michael Bublé, Stevie Wonder, John Mayer, Babyface, Billy Joel, Blake Shelton, Lionel Richie, Andrea Bocelli, John Legend, Josh Groban, my beloved son Jason Gould…and last but not least, Elvis Presley…forever The King! Finally, thank you to Rob Stringer and my Columbia Records family, my manager Marty Erlichman, my creative team on this project – Kenny Edmonds, Walter Afanasieff, Dave Reitzas, Bill Ross, and Jay Landers…and Ken Sunshine for getting the word out…we did it guys!! With lots of love, BarbraRecognized as an icon in multiple entertainment fields, Ms. Streisand has attained unprecedented achievements as a recording artist, actor of stage and screen, concert performer, movie producer, film director, author, songwriter and philanthropist. In her accomplished career she has been awarded two Oscars, five Emmys, ten Golden Globes, eight Grammys plus two special Grammys; a Lifetime Achievement Award and a Grammy Legend Award, a special Tony award in 1970 as Star of the Decade, and two Cable Ace awards – the only artist to receive honors in all of those fields of endeavor. Ms. Streisand is the recipient of the American Film Institute’s Lifetime Achievement Award, the National Endowment for the Arts Medal, two Peabody Awards and the French Légion d’honneur. Ms. Streisand is also the first female film director to receive the Kennedy Center Honors. 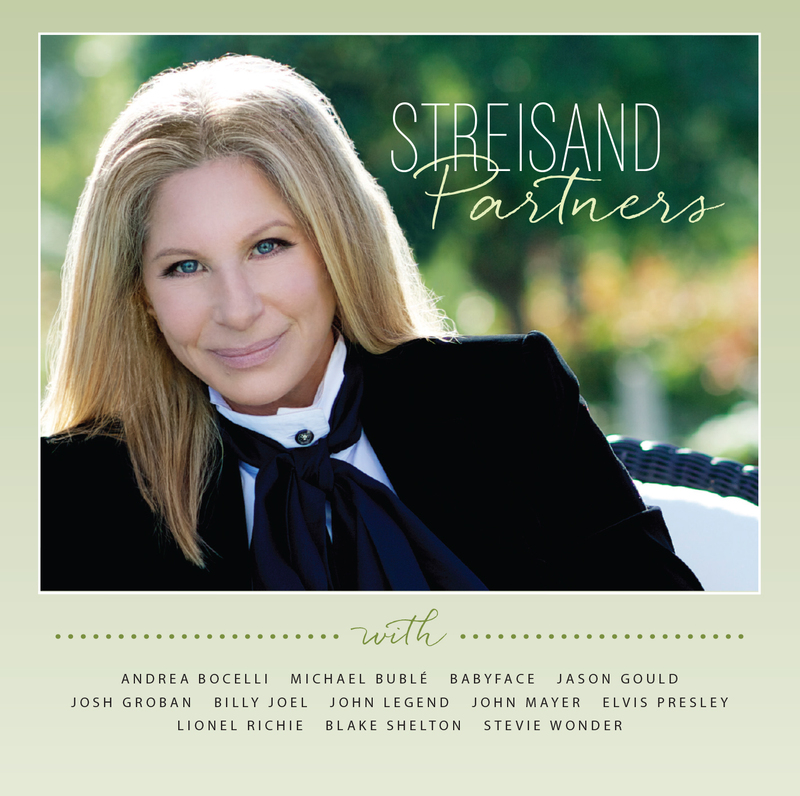 Sony Music has announced the upcoming release of Barbra Streisand’s “Partners” album, to debut on September 15th 2014, featuring 12 inimitable new Streisand duets with the world’s greatest male vocalists. Ms. Streisand took to Instagram on August 11th to announce to the world the official release date for “Partners,” her first ever use of Instagram to herald a new recording. Fans can pre-order “Partners” beginning today. The inspired new musical pairings on “Partners” include, Andrea Bocelli, Michael Bublé, Kenneth ‘Babyface’ Edmonds, Jason Gould, Josh Groban, Billy Joel, John Legend, John Mayer, Lionel Richie, Blake Shelton, Stevie Wonder and a breathtaking virtual duet with the King of rock n’ roll, Elvis Presley. The new album, which is executive produced by Ms. Streisand and Jay Landers, is produced by ‘Babyface’ and Walter Afanasieff. “Partners” is comprised of 12 songs, many of which are regarded as Streisand classics. Among the songs included are “New York State Of Mind,” with Billy Joel, “It Had To Be You,” with Michael Bublé (which received its first global play on BBC Radio 2’s The Ken Bruce Show on Wednesday 13th August) , “Come Rain Or Come Shine,” with John Mayer, “Love Me Tender,” with Elvis Presley, “The Way We Were,” with Lionel Richie, “What Kind Of Fool,” with John Legend, “People,” with Stevie Wonder, “I Can Still See Your Face,” with Andrea Bocelli, “Evergreen,” with Babyface, and Ms. Streisand’s first studio-recorded duet with her son Jason Gould, on “How Deep Is The Ocean.” The UK version of the album has 5 additional bonus duets including the Streisand classic, “Guilty” with Barry Gibb. Throughout her career, Barbra Streisand has generously shared microphone and spotlight to create some of the most magical duets in music history. Ms. Streisand has elevated the craft of pairing incomparable vocal styles with impeccable song choices, transforming the realm of the duet into the summit of collaborative artistry. For more than six decades she has seamlessly blended such extraordinary moments – both live and in the studio – into an acclaimed body of work that is unrivaled in popular music. Ms. Streisand is currently the best-selling female recording artist in history and the only woman to make the All-Time Top 10 Best Selling artists list, an honor which includes “Partners” duettist Elvis Presley. Ms. Streisand has recorded 51 gold, 30 platinum and 13 multi-platinum albums in her career, including nine #1s, and is the only recording artist to have accomplished #1 album in five consecutive decades in the US. Recognized as an icon in multiple entertainment fields, Ms. Streisand has attained unprecedented achievements as a recording artist, actor of stage and screen, concert performer, movie producer, film director, author and songwriter. In her accomplished career she has been awarded two Oscars, five Emmys, ten Golden Globes, eight Grammys, a special Tony award in 1970 as star of the decade, and two Cable Ace awards – the only artist to receive honors in all of those fields of endeavor. Ms. Streisand is the recipient of the American Film Institute’s Lifetime Achievement Award, the National Endowment for the Arts Medal, two Peabody Awards, A Grammy Lifetime Achievement Award and a Grammy Legend Award. Ms. Streisand is also the first film director to receive the Kennedy Center Honors. Babyface: Has written and produced over 26 No. 1 R&B hits throughout his career. He has won 10 Grammy Awards. Andrea Bocelli: Has recorded fourteen solo albums, selling over 100 million records worldwide, making him one of the best-selling music artists. In 1999, he was nominated for Best New Artist at the Grammy Awards. “The Prayer”, his duet with Celine Dion for the animated film Quest for Camelot, won the Golden Globe for Best Original Song and was nominated for an Academy Award in the same category. Seven of his albums have since reached the top 10 on the Billboard 200. Michael Bublé: Has won four Grammy Awards and multiple Juno Awards. Bublé’s 2009 album Crazy Love debuted at number one on the U.S. Billboard Top 200 after three days of sales, and remained there for two weeks. Jason Gould: Actor, director, producer, writer and singer, his self-titled EP garnered rave reviews in 2012, as did his live duets with Barbra Streisand on her 2012 fall tour and her live CD/DVD package of Ms. Streisand’s critically acclaimed 2012 “Back To Brooklyn” concert. Josh Groban: His first four solo albums have been certified multi-platinum, and in 2007, he charted as the number-one best selling artist in the United States with over 21 million records in the nation. To date, he has sold over 25 million records worldwide. Josh appeared on Ms. Streisand’s 2002 album, “Duets,” a compilation of her duet performances throughout her career, form 1963 to 2002. Billy Joel: Has become the sixth best-selling recording artist and the third best-selling solo artist in the United States. He is also a six-time Grammy Award winner who has been nominated for 23 Grammy Awards throughout his career. He has sold more than 150 million records worldwide, making him one of the best-selling artists of all time. John Legend: Has won nine Grammy Awards. He has gained chart topping hits from his solo work, including the Billboard Hot 100 No.1 peaking single, “All of Me”. John Mayer: In 2003, he won a Grammy Award for Best Male Pop Vocal Performance for “Your Body Is a Wonderland.” He has sold over 10 million albums in the U.S. and over 20 million albums worldwide. Elvis Presley: The king of rock n’ roll, he is the best-selling solo artist in the history of recorded music, with estimated album sales of 600 million units worldwide. He was nominated for 14 Grammys and won three, receiving the Grammy Lifetime Achievement Award at age 36. Lionel Richie: Has sold more than 100 million records worldwide, making him one of the best-selling artists of all time. Has won two Grammys. Blake Shelton: Has charted 24 country singles, including 11 #1’s. He has been nominated five times for a Grammy Award. Has won the Academy of Country Music’s Entertainer of the Year twice. Stevie Wonder: Has recorded more than thirty U.S. top ten hits and received twenty-two Grammy Awards, the most ever awarded to a male solo artist, and has sold over 100 million albums and singles, making him one of the Top 60 best selling artists.